One of the things I love about blogging is being able to push myself to try out new foods and ingredients that I never thought I'd try. I'm not saying it because certain foods might not be available where I live. On the contrary, I can find any ingredient needed in the city, either in Publix, or Whole Foods, or Epicure, or if needed as a last resort, online. What I mean about pushing myself is that I grew up as a very picky eater, and it carried out into my grown-up years. I would try to avoid vegetables and nuts as much as possible, and let's lump weird flavor combinations into that "to-avoid" list. I would stick to the basics of chicken, meat, salmon, rice, and pasta. Salads, quiches, tarts? Oh no! It was only until a few years ago that I decided to branch out and try new recipes which would be cool to feature on my site. If you've been following my site, you've been able to see new recipes featuring eggs (such as the deviled eggs) to shrimp (such as in spring rolls) to many more in the coming future with seafood and tons of different vegetables. 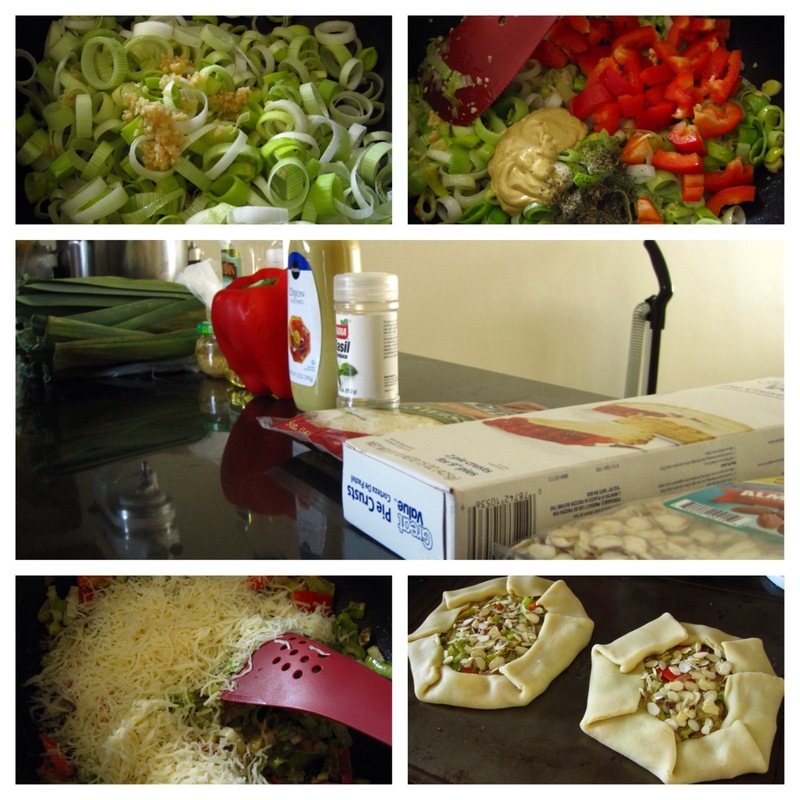 But for now, a recipe that features leeks and peppers is up next on the recipe queue. They're mixed together along with a new cheesy undertone and a crunchy almond topping. This recipes yield 2 big tarts which can be sliced any which way you want even though the recipe says to cut each into 12 slices. I bet this tart can be mixed up with different cheeses or different peppers so feel free to change it up a bit and let me know how it all comes out! "Impress your guests with these free-form tarts. Sweet peppers and leeks make them irresistible." 1) For filling, in a large skillet cook leeks and garlic in hot oil about 5 minutes or until tender. Remove from heat; stir in sweet pepper, mustard, and basil. Cool slightly; stir in shredded cheese. Set filling aside. 2) Preheat oven to 375F. Unfold pie crust according to package directions. On a lightly floured surface, roll one pie crust into a 12-inch circle. Transfer to a baking sheet. Spread half of the filling in the center of the pie crust, leaving a 1 1/2-inch unfilled border. Fold edge up and over outer edge of filling, pleating as necessary. Sprinkle 1 tbsp of the almonds over uncovered filling. 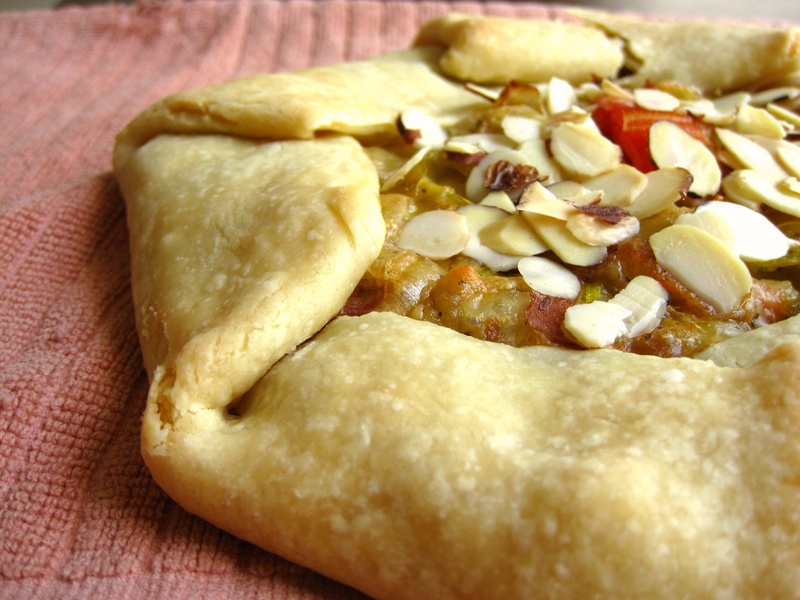 Repeat with remaining pie crust, filling, and almonds. 3) Bake about 25 minutes or until crusts are golden brown. Cool for 10 minutes on baking sheets. Cut each tart into 12 wedges. Serve warm or at room temperature.